Students encouraged to "do it for the love and because it's the best job in the world". 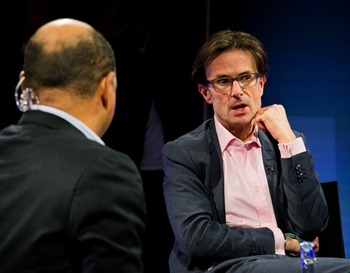 BBC Economics Editor Robert Peston offered his advice to aspiring journalism students at Middlesex University in December, when he visited its London campus to sit in the Broadcasting Today hotseat. Answering questions from Professor of Journalism Kurt Barling and BA Journalism and Media student Evelyn Keryova, he offered insight into his hugely successful career and revealed the tricks behind his many scoops. Talking to a crowded audience in the University's TV studio, Peston encouraged aspiring journalists to go out into the real world and do some journalism. That is the best way to get your work noticed and get a foot on the career ladder, he said. "Journalism today is about saying something different, putting your own take and style on things," he told the audience, adding: "You're not going to get rich in journalism, so you have to do it for the love and because it's the best job in the world." Having broken some of the biggest news stories of the last decade during his coverage of the global financial crisis, students were understandably keen to know his secret but may not have been surprised by his answer. "Take advantage of the opportunities you have at university to learn about all the different ways of communicating ideas" - Robert Peston. "Getting a scoop is about immersing yourself in what's going on and having a sense of where a story is going," he said. Much of it was also about acquiring contacts and gaining people's trust, he added, so they are willing to talk to you and share information. While Peston began his journalism career at Investors Chronicle magazine, he admitted to students that he didn't know much about being a journalist to begin with but got through the interview using all that he learned during a few months working as a stockbroker in the City. Working as the magazine's banking correspondent gave him a deep understanding of the way the industry works and paved the way for later career successes. He confessed that while he thought the role was like being "sent to the salt mines" at the time, the knowledge he acquired then gave him a significant advantage over his rivals when it came to reporting the financial crash. Becoming an expert in one area like this could be beneficial to working in journalism, he told students. "You will be very lucky if you have a career in the media specialising in just one area," he said. "It is much harder to be a generalist than a specialist. There are lots of people who can write a pretty piece or put a nice film together, so try to become a leading authority on one thing. "I would advise you all to take advantage of the opportunities you have at university to learn about all the different ways of communicating ideas." Robert Peston was speaking on Broadcasting Today, an online television series researched, written, produced, filmed and edited by Middlesex students. Watch the series.